The My Place Teen Center holiday party Monday had an unexpected guest. In a surprise announcement, Idexx Laboratories presented the Westbrook teen center with a van full of gifts — and the keys to it. The 2005 Chevrolet G350 is a hand-me-down from the Westbrook company, which was getting ready to retire the vehicle from its fleet. 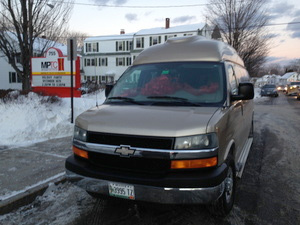 Instead, the van got new parts and systems and was given to the teen center. It will be repainted with the My Place Teen Center logo, according to a press release from Idexx. The company also donated a 30,000-mile maintenance package. In addition, the donation qualifies the teen center for a $20,000 grant from the Cornelia Warren Foundation to buy fuel. Donna Dwyer, director of the teen center, thanked Idexx at the party, which was attended by more than 100 teens, according to the press release. “The goodness in our community is overwhelming,” she said.